Located on the left bank of the Rhone where the first bridge was built across the river, Guillotière is the gateway to the city and the final destination of many migrants. It is a popular, multiethnic neighbourhood with a large student population. Social indicators reveal a situation of social hardship, and real estate is often in anything but a good condition. However, although the first signs of gentrification are visible it has yet to affect social diversity. Biological shops, art galleries, bookshops and graphic studios occupy empty ground floors next to bars, African coiff’, tea shops, Arab butcher shops, a mosque and several Indian restaurants. The roads and buildings are narrow and close-knit, especially south of Cours Gambetta. 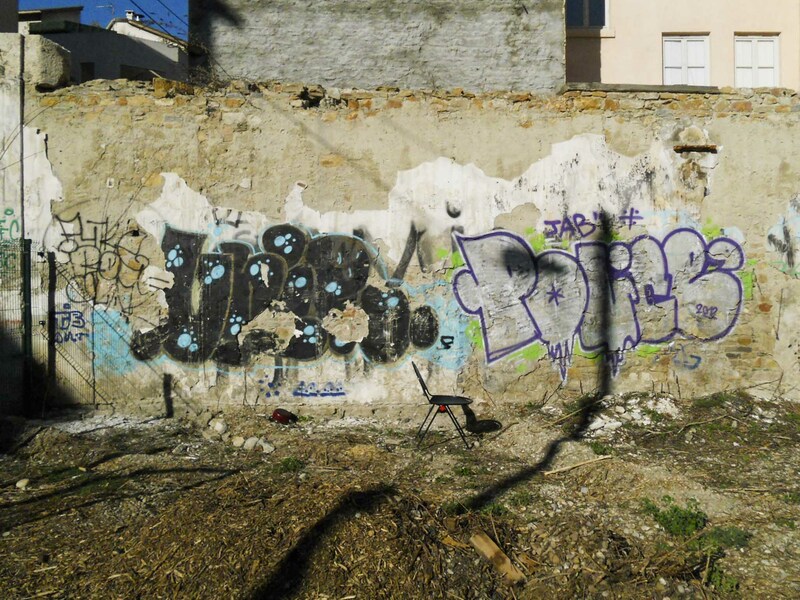 Only some recent demolitions, part of an old project to broaden Avenue Félix Faure, have created several open spaces in which local residents have invested heavily. For example a local art gallery which in 2003 used the funds provided by the town council to sponsor the construction of a garden and set up an association that created several kitchen gardens and a compost area. 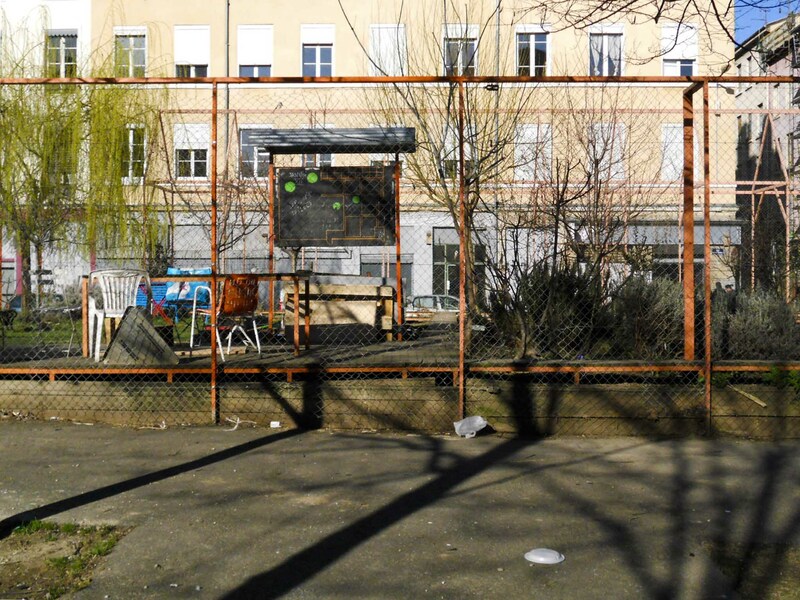 Although the area was fenced off to avoid vandals, the association has tried to keep it open as much as possible so that neighbourhood residents can use it; events and classes were organised and other neighbourhood associations were invited to participate. Over time these activities increased and lately a cooperative bar opened in the same block; the bar organises concerts and small exhibitions, and promotes the use of local products. Several associations, either created ad hoc or already present, have come together around this garden which has gradually evolved into a sort of fragmented and heterogeneous neighbourhood square. The space developed slowly, little by little; apart from the characteristic orange sign of the Amaranthes garden (initially built as an artwork), its uses evolved rather than its form. 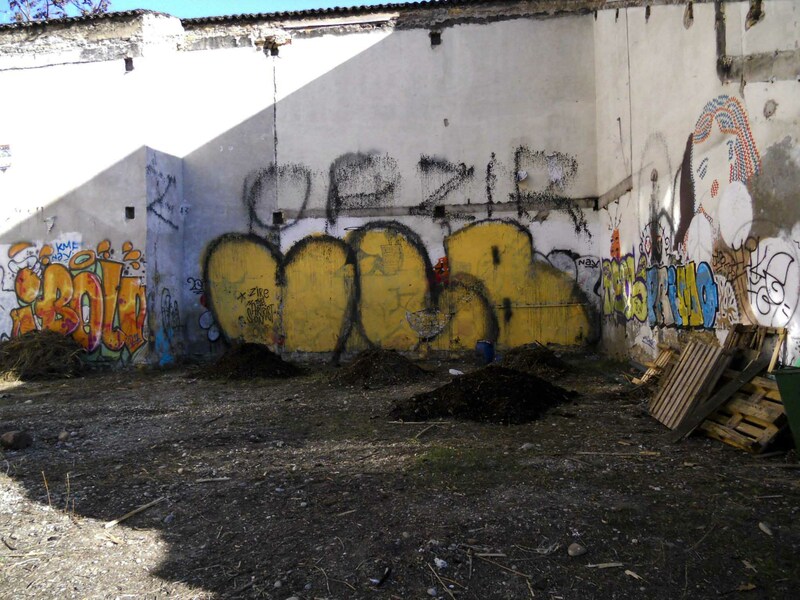 Based on a paratactic logic, this area now hosts small parking areas, a golf course, kitchen gardens and sheds, a compost area, the tables of the cooperative bar, some empty areas, huge murals discovered during the demolition, and buildings still waiting to be demolished (some of which are occupied by Romany families). These juxtaposed spaces create openings in what would otherwise be a close-knit and packed urban fabric, but without generating a large open space, outsized compared to the dense network of buildings and narrow streets. These spaces have a precarious, temporary, unfinished and vague air about them, which means that any future transformation has ample space in which to manoeuvre; nevertheless, they have left deep-rooted and difficult-to-ignore traces on the terrain. 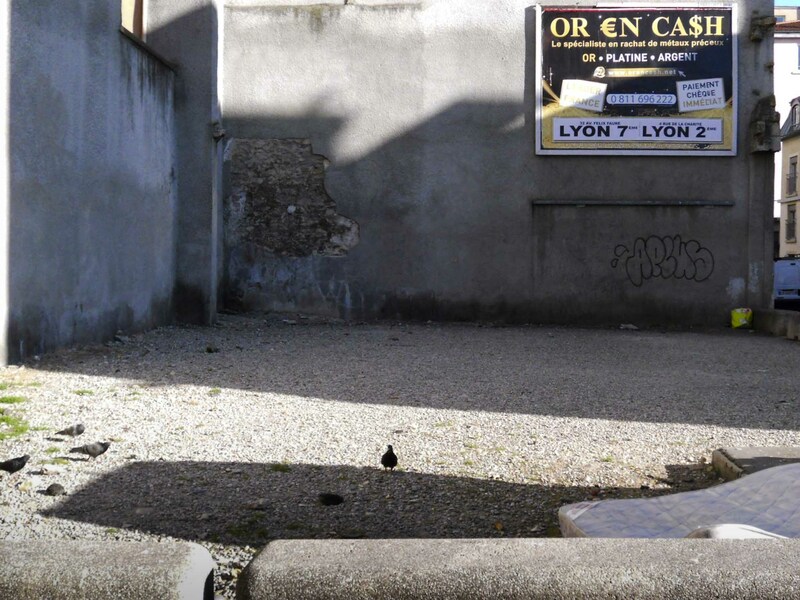 In 2010, the Grand Lyon, the public authority governing the city of Lyon, began to think about how to reorganise these empty spaces; it abandoned the idea of enlarging Avenue Félix Faure and instead proposed to build city neighbourhoods. 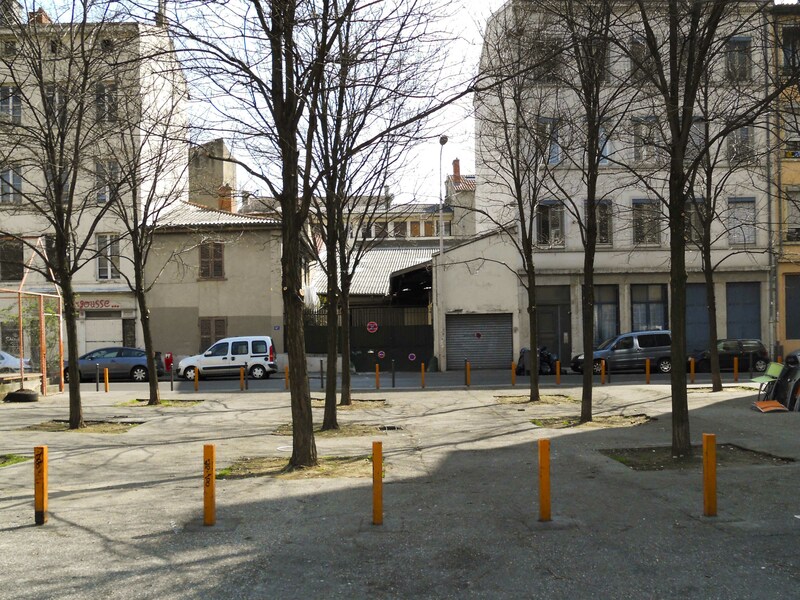 Based on its consolidated experience of using public spaces to renovate the city, Grand Lyon decided to solve the shortage of green areas and revamp a problematic urban fabric. However, part of the project involved regaining control over a public space and intervening in a enclave neighbourhood by building several green areas rather than a road. The neighbourhood associations were immediately alarmed by the proposed project. They demanded to be consulted citing the many initiatives they had promoted in the area, initiatives which ran the risk of being suffocated by this generic coulee vert. Although they said they were not against this public project, on the contrary they were actually in favour of a project that could fulfil the many outstanding needs of local residents, the associations still defended the very unique spirit of these areas, characterised by diversity, peaceful militancy and a certain measure of spontaneity. 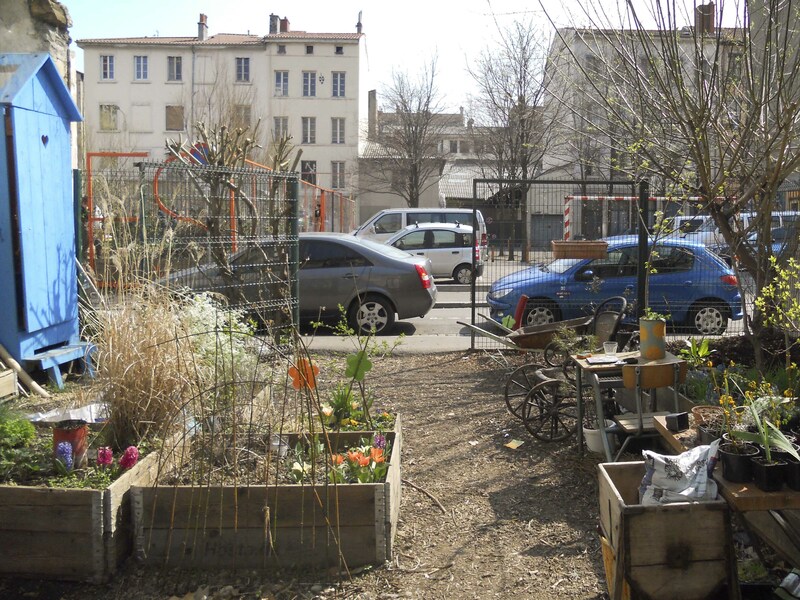 During the meetings organised in 2011 by Grand Lyon a consensus was reached on several general objectives; this consensus evolved into a tender for the redesign of îlot Mazagran, the block with the Amaranthes garden, cooperative bar and compost area. The main challenge in the working document was to see how the project could be implemented in this kind of space without ruining the spirit that the associations asserted and defended so vehemently: to maintain not only incremental development through the work of the inhabitants, but also its ‘vague’, spontaneous air and its status as a multipurpose area. 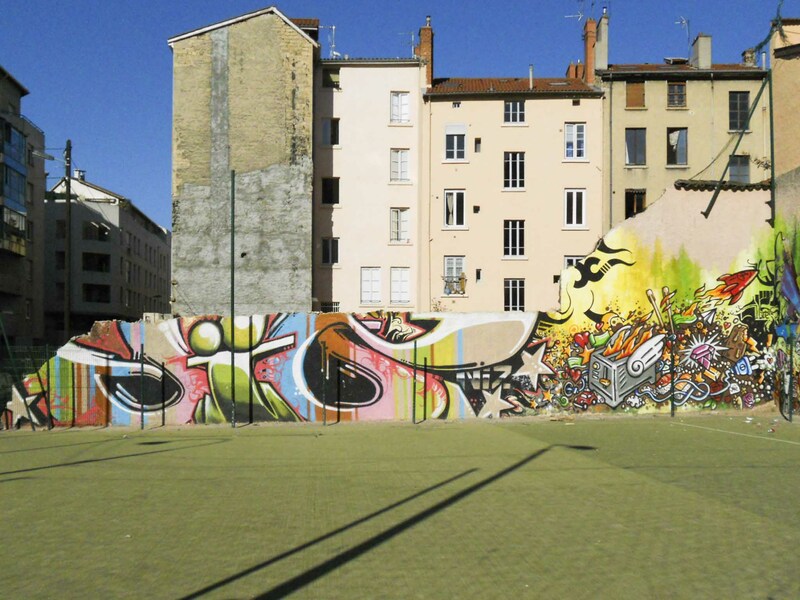 Grand Lyon had been conducting urban renovation projects since the nineties; these projects in public areas were considered as democracy at work and often included areas open to everyone: places for different social groups to meet and dialogue. However the space in îlot Mazagran is different; it contains juxtaposed items characterised by a certain ‘closure’ which in some ways reflects the conformation of the neighbourhood where Arab butcher’s shops, African bars and biological shops all stand side by side. Anyone can visit these places, but inevitably they unite well-defined populations and customs and remain more or less impermeable to others. Cohabitation through proximity rather than integration. The Amaranthes garden is a perfect example. On the one hand it was fenced off to avoid vandalism and is run by an association. On the other, its ‘open’ spirit was preserved by organising public events and using a transparent fence; inside the fence there’s a small rest area with the only public bench for many blocks. This use of space seems to mirror the dynamics of sharing that inspired the initiative: groups that support each other voluntarily but on a temporary basis, that are not a closed and well-defined community or, even less so, an individual and atomised society. The tender also raises the question of how open the park is; it calls for a space that is more accessible than it is today, a space that can be enjoyed by all social groups. A unitary, flexible, multifunctional space that can be used in different ways, ways which from time to time can be introduced and implemented. The park should be open to different social and ethnic classes and its use should change over time: daytime/nighttime, from season to season, or long-term with the incremental construction of a new public space. On the one hand, the tender wants to move beyond the current configuration of the Mazagran block, considered as too fragmented and limited, a place where many areas are fenced off and used for a specific purpose. On the other hand, there’s a desire to shy away from a generic opening of the park and instead build a dense space of relationships and possibilities where fences are replaced by gradation, small changes in ground level, dimensions, transparencies, spatial variations created by shade and shadow, different pavement surfaces, and the presence of vegetation. Not an easy balance, as difficult to find as the one between defined and undefined space. The tender specified that the area was to be used for generic activities, open to spontaneous appropriation and discovery. Something flexible and able to accommodate many different and not always reconcilable needs. During meetings local residents expressed their preference for a chiefly green area, natural and wild, where it was possible to hold events and social gatherings, organise games for children and youngsters, build a fountain or small lake, and leave lots of space for kitchen gardens and gardens. This concept of ‘openness’ included current and future forms of fruition. The tender talked about a “village square” considered as a local meeting place not too close to the large main roads. Rather than a city-type square this was to be a neighbourhood agora based on a very precise idea of how to live together; a place where “everyone can come together drawn by collective activities such as gardening and urban agriculture”. Although the associations that had mobilised in the past were in favour of these activities, this enthusiasm was probably not shared to the same extent by immigrants or Romany families. It is possible that the spirit of integration behind the tender developed by the local administration and participated by the associations and local residents will only involve a small percentage of the non-European populations present in the neighbourhood; this raises the question of how, and whether, to involve them in the design of a public space in a multiethnic neighbourhood that is much more heterogeneous than the image projected by the “village”. The tender, based on the events of the past ten years in the îlot Mazagran, is an open invitation to experiment with new ways of building public space, ways which can reconcile the implicit request for a unitary project and the desire to leave a certain amount of indeterminacy in order to allow spontaneous appropriation and an incremental construction of space: in this context institutions should reinforce rather than jeopardise the work of the associations. Not easy goals, but ones which undoubtedly raise interesting design challenges. Situata sulla riva sinistra del Rodano, in corrispondenza del primo ponte costruito sul fiume, la Guillotière è stata la porta d’ingresso della città e un luogo di arrivo per molti migranti. È un quartiere popolare e multietnico, con un’alta presenza di studenti. Gli indici sociali mostrano una situazione di un certo disagio e il patrimonio immobiliare spesso è in condizioni tutt’altro che buone. Tuttavia, sono evidenti i primi segni di un processo di gentrificazione, ancora lontano, però, dall’aver intaccato la diversità sociale. Nei piani terra vuoti si sono installati negozi biologici, gallerie d’arte, librerie e studi di grafica, che hanno trovato posto accanto a bar e coiff’ africani, sale da the e macellerie arabe, una moschea e alcuni ristoranti indiani. La trama viaria e il tessuto edilizio sono minuti e serrati, soprattutto a Sud di cours Gambetta. Solo alcune demolizioni recenti, legate a un vecchio progetto di estensione dell’avenue Félix Faure, hanno aperto alcuni spazi, i quali sono stati investiti da una forte azione degli abitanti. A partire da un’iniziativa di una galleria d’arte locale, che nel 2003, con il supporto finanziario della municipalità, ha promosso la costruzione di un giardino, si è costituita un’associazione che ha creato alcuni orti e un’area di compostaggio. 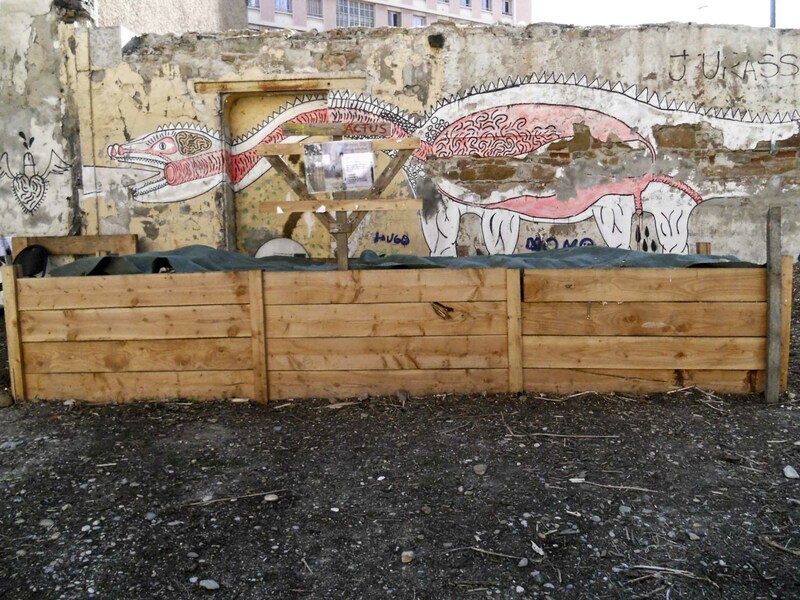 Pur nella necessità di mantenere chiusa l’area, per evitare vandalismi, l’associazione ha cercato di aprirla il più possibile al quartiere, organizzando eventi e corsi e coinvolgendo altre associazioni presenti nell’area. Nel tempo le attività si sono estese e recentemente, nello stesso isolato, è nato anche un bar cooperativo, che organizza concerti, piccole mostre e promuove l’uso di prodotti locali. Attorno a questi spazi si è coagulata l’azione di varie associazioni, create appositamente o già esistenti, che pian piano hanno fatto di quest’area una sorta di piazza di quartiere, ma con un carattere frammentario ed eterogeneo. Lo spazio si è costruito per aggiunte successive, dove, a parte il caratteristico segno arancione del giardino d’Amaranthes, costruito inizialmente come opera d’arte, sono gli usi a emergere, piuttosto che le forme. 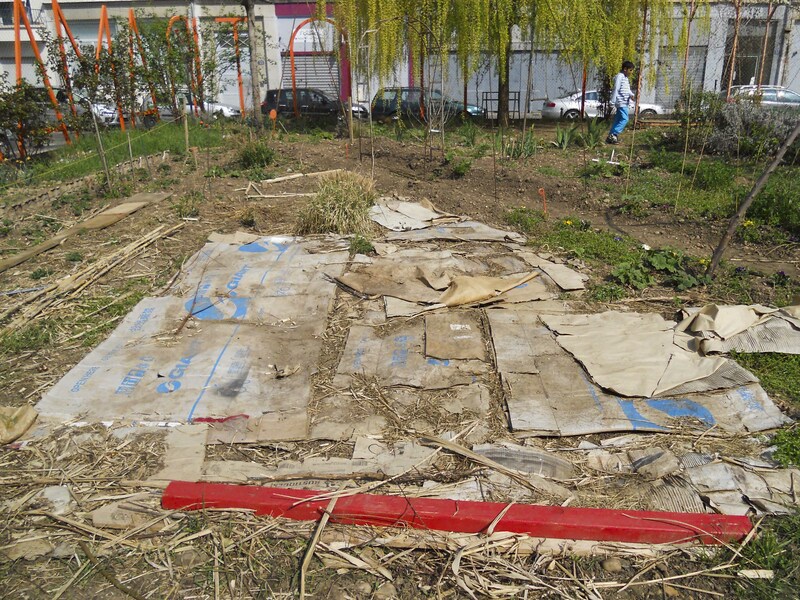 Secondo una logica paratattica, hanno trovato spazio, l’uno a fianco all’altro, piccoli parcheggi, un campo da gioco, gli orti con i relativi magazzini, un’area di compostaggio, i tavoli del bar cooperativo, alcune aree ancora vuote, grandi murales sulle pareti scoperte dalle demolizioni, degli edifici in attesa di essere abbattuti, di cui alcuni occupati da famiglie rom. La giustapposizione di questi spazi riesce a creare delle aperture in un tessuto altrimenti fitto e serrato, ma senza introdurre un grande spazio aperto, fuori scala rispetto agli edifici fitti e le strade anguste. Spazi che mantengono, inoltre, un carattere d’indeterminatezza, di non finito, di precario e provvisorio, che lascia aperti molti margini di manovra per future trasformazioni, ma, che, nondimeno, hanno depositato sul luogo delle tracce ormai ben radicate e difficilmente eludibili. Nel 2010 la Grand Lyon, l’ente che governa l’agglomerazione urbana lionese, inizia una riflessione per riorganizzare questi vuoti, abbandonando definitivamente l’idea di estendere l’avenue Félix Faure, per proporre invece la creazione di alcuni spazi urbani di prossimità. Forte di un’esperienza ormai consolidata, che ha fatto degli spazi pubblici una delle principali leve del rinnovamento della città, la Gran Lyon si propone di sopperire alla mancanza di spazi verdi e risanare un tessuto abitativo problematico. Tuttavia, non può essere disconosciuta anche un’intenzione di ristabilire un controllo su uno spazio pubblico e di intervenire in un quartiere enclavé, tramite l’apertura non di una strada, ma di una sequenza di spazi verdi. Le associazioni presenti nell’area si sono mostrate da subito preoccupate dal progetto dell’amministrazione. Hanno rivendicato voce in capitolo, difendendo le molte iniziative depositate in questi spazi, che rischiano di perdersi all’interno di una generica coulée vert. Pur dichiarandosi ben disposte verso un intervento pubblico, e anzi, dicendosi favorevoli a un progetto che potrebbe sopperire a molte necessità tuttora insoddisfatte, le associazioni hanno difeso, però, lo spirito con cui questi spazi si sono così nettamente caratterizzati, improntati alla diversità, a una militanza pacifica e a una certa dose di spontaneismo. Una serie di riunioni organizzate nel 2011 dalla Grand Lyon ha permesso di concordare alcuni obiettivi generali, che si sono tradotti in un bando di concorso per la riprogettazione dell’îlot Mazagran, l’isolato con il giardino d’Amaranthes, il bar cooperativo e l’area di compostaggio. La principale sfida che emerge dal documento di lavoro è come un progetto possa intervenire su uno spazio di questo tipo, senza guastarne lo spirito che le associazioni hanno tenacemente difeso e rivendicato: il potersi costruire in modo incrementale attraverso l’azione degli abitanti, mantenere una certa dose d’indeterminatezza e spontaneità, l’essere aperto a usi diversi e molteplici. La lunga esperienza di rinnovamento urbano condotta dalla Grand Lyon fin dagli anni Novanta, in cui l’intervento sugli spazi pubblici è stato inteso come una messa in opera della democrazia, ha spesso promosso progetti in cui lo spazio è accessibile a tutti: un terreno d’incontro e di scambio per i diversi gruppi sociali. Quello che ora è presente nell’îlot Mazagran, però, è uno spazio diverso, in cui a convivere sono cose tra loro giustapposte e caratterizzate da una certa chiusura, che in qualche misura rispecchiano la conformazione del quartiere, dove convivono a stretto contatto macellerie arabe, bar africani e negozi biologici. Luoghi aperti a chiunque, ma che inevitabilmente coagulano popolazioni e usi ben definiti, rimanendo in buona misura impermeabili ad accoglierne altri. Una convivenza data per prossimità, piuttosto che per integrazione. Il giardino d’Amaranthes è esemplare a riguardo. Da un lato è stato chiuso da un recinto per evitare problemi di vandalismo ed è gestito da un’associazione. Dall’altro lo spirito di apertura è mantenuto sia attraverso l’organizzazione di eventi, sia per mezzo di una recinzione trasparente, che ingloba anche un piccolo luogo di sosta, unica panchina pubblica nel raggio di molti isolati. Una forma di usare lo spazio che sembra ricalcare le dinamiche della condivisione che lo sorreggono: gruppi che si sostengono su un’adesione spesso volontaria e non continuativa, che non sono né la comunità chiusa e definita, né, tanto meno, la società individuale e atomizzata. La questione dell’apertura è sollevata anche dal bando, che richiede uno spazio più accessibile rispetto a quelli attuali, fruibile da ogni gruppo sociale. Uno spazio unitario, che sia flessibile, multifunzionale e disponibile a venire usato in vari modi, che possa dare adito a un utilizzo che di volta in volta va scoperto e costruito. Aperto sia a vari tipi di popolazioni, sia ai diversi usi che si succederanno nel tempo: quello ciclico delle ore del giorno e delle stagioni, e quello lungo della costruzione incrementale del nuovo spazio pubblico. Da un lato, il bando intende andare oltre la configurazione attuale dell’isolato Mazagran, sentita come troppo chiusa e frammentaria, in cui molti spazi sono recintati e ognuno è dedicato a una funzione specifica. Dall’altro lato, però, emerge la volontà di rifuggire una generica apertura e di costruire uno spazio denso di relazioni e possibilità, in cui, piuttosto che le recinzioni, bisognerà affidarsi a gradazioni, piccoli salti di quota, spessori, trasparenze, variazioni dello spazio date dall’ombreggiamento, dalle diverse superfici di pavimentazione, dalla presenza della vegetazione. Un equilibrio non facile da trovare, al pari di quello tra determinato e indeterminato. Il bando chiede uno spazio non troppo caratterizzato da attività specifiche, aperto all’appropriazione spontanea e alla scoperta. Qualcosa di lasco, che però deve essere in grado di accogliere molte esigenze diverse, non sempre facilmente conciliabili tra loro. Dalle riunioni con gli abitanti è emersa la volontà di creare un’area a prevalenza vegetale, con un carattere naturale e selvatico, che deve poter accogliere feste ed eventi, i giochi dei bambini e dei ragazzi, una fontana o un bacino d’acqua e che deve lasciare ampio spazio agli orti e ai giardini. L’idea di apertura coinvolge anche le forme di partecipazione messe in atto e quelle da adottare in futuro. L’immagine richiamata dal bando è quella della “piazza di villaggio”, intesa come un luogo di ritrovo locale, che deve mantenere una certa distanza rispetto ai grandi assi di circolazione esterni. Piuttosto che una piazza alla scala metropolitana, si vuole un centro per la vita di quartiere, sorretto da una chiara idea di come stare insieme, dove “tutti si possano ritrovare intorno a pratiche collettive di giardinaggio e d’agricoltura urbana”. Pratiche che sono condivise dalle associazioni che si sono mobilitate, ma che probabilmente sono molto meno sentite dalle popolazioni immigrate o dalle famiglie rom. In questo modo, lo spirito di integrazione che anima il bando, nato dalle intenzioni dell’amministrazione e della partecipazione delle associazioni e degli abitanti, rischia di coinvolgere solo in minima parte le popolazioni extra-europee, ponendo il problema di come e se integrarle nel progetto di uno spazio pubblico che dovrà confrontarsi con un quartiere multietnico, molto più eterogeneo di quanto l’immagine del “villaggio” restituisca. Il bando di concorso, a partire dall’esperienza che si è depositata nell’îlot Mazagran in un decennio, invita a sperimentare modi innovativi di costruire lo spazio pubblico, che possano conciliare la richiesta implicita di un progetto unitario con la volontà di lasciare un ampio grado d’indeterminatezza, al fine di permettere un’appropriazione spontanea e una costruzione incrementale dello spazio; in cui il sostegno istituzionale dovrebbe rafforzare l’azione delle associazioni, piuttosto che comprometterla. Obiettivi evidentemente non facili, ma che pongono una sfida progettuale di indubbio interesse.